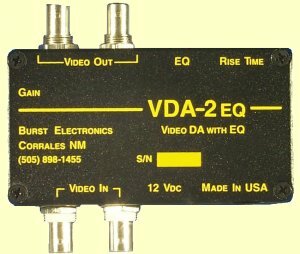 The two output VDA-2EQ is a compact unit featuring a looping input. EQ and Rise Time adjustments allow for up to 1000 feet of RG59 cable. Small enough to fit most anywhere but with no sacrifice in performance. There is an internal jumper to select 75 Ohm termination, no need for an external terminator. Size: 4.4 W x 2.4 H x 1.3 D inches.